“Bringing high-tech innovations to market is part of how NY-BEST is continuing to drive economic activity and create jobs in the Rochester area," Governor Cuomo said. “With the opening of the new Test and Commercialization Center, this public-private partnership will provide more of the tools needed to convert the ideas of our State's brightest innovators into products that strengthen our energy grid and grow the economy. I congratulate NY-BEST on this milestone, and look forward to seeing them lead the way in the development of new energy storage technologies." Lieutenant Governor Robert J. Duffy said, “This new, operational center builds upon New York and Eastman Business Park's manufacturing and technology expertise, and thanks to Governor Cuomo's vision, we consistently remain at the center of this growth. 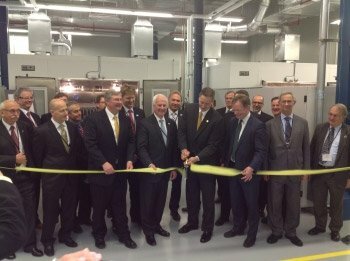 Rochester continues to grow and develop in symbiosis with the Eastman Business Park, and I congratulate NY-BEST and DNV GL on officially locating to the BEST Test and Commercialization Center." Dr. William Acker, Executive Director of NY-BEST said, “NY-BEST, together with our partner DNV GL, is proud to announce that the BEST Test and Commercialization Center is open for business. Many global leaders in energy storage technology research and development and manufacturing call New York home. By filling an important gap that currently exists in the product development process for batteries and energy storage technologies, the Center will serve as a magnet to attract and grow the energy storage industry here in New York. We are extremely grateful for the support of Governor Cuomo and our New York State partners and we are excited to work with DNV GL as we commence operations." Executive Vice President of Energy Advisory for DNV GL Energy Hugo van Nispen said, “DNV GL is committed to the success of this laboratory which will provide meaningful support along multiple dimensions, as distributed energy resources and renewables increasingly impact the grid. Leveraging the finest state-of-the-industry testing equipment and procedures, we aim to help our customers drive the marketability and efficacy of new storage technologies and applications to address challenges and opportunities associated with the ongoing energy transition. We are pleased to invest in this distinctive lab which is built on a 150 year heritage in independent testing and fortified with comprehensive commercialization services from product development to market analysis, feasibility studies and beyond." President and CEO of NYSERDA John B. Rhodes said, “We congratulate NY-BEST and DNV GL on the opening of the BEST Test and Commercialization Center. The Center is another example of Governor Cuomo's efforts in scaling up the State's cleantech sector and stimulating economic activity in the Finger Lakes region. The work that will take place at the Center will lead to battery and energy storage innovations that can help make the State's energy system operate more efficiently, effectively and with greater resilience." Empire State Development President, CEO & Commissioner Kenneth Adams said, “Today's grand opening makes it clear that Eastman Business Park is one of the nation's premiere sites for the testing and commercialization of next-generation energy storage technologies. This state-of-the-art test and commercialization center is the product of a strong partnership between Governor Cuomo, Rochester and Kodak and I am pleased that Empire State Development could contribute $1 million to make it a reality and further grow the clean energy economy." Assembly Majority Leader Joseph D. Morelle said, “Today's official opening of the NY-BEST Test and Commercialization Center marks yet another important step forward in the rebirth of the Eastman Business Park. With the support of public-private consortiums, such as NY-BEST, and partnerships like the one created with DNV GL, we will continue to strengthen our region's position as a leader in innovative energy technology development and ensure a bright future for the Business Park. I applaud the Governor, the Regional Economic Development Council and all of our local partners for coming together in support of this project." State Senator Joe Robach said, “The addition of the BEST Test and Commercialization Center to Eastman Business Park is great news for the Rochester region and the continued improvement of our local economy. Eastman Business Park continues to re-invent itself in to a national research and innovation hub, attracting new businesses and creating new jobs for our workforce, with the BEST Test and Commercialization Center being the latest to invest in the Rochester community." Finger Lakes Regional Economic Development Council Co- Chairs Joel Seligman, President, University of Rochester, and Danny Wegman, CEO of Wegmans Food Markets, said, “We are delighted to see the BEST Test and Commercialization Center come to fruition and we look forward to its continued success. This project illustrates the Finger Lakes Regional Economic Development Council's top priority to utilize Eastman Business Park in Rochester as a pivotal regional economic development resource to grow a cluster of clean tech businesses at the Park." President & CEO of the Greater Rochester Enterprise Mark S. Peterson said, “The public-private partnership model utilized to establish the BEST Test and Commercialization Center is a smart, strategic way to build our economy. Companies that utilize this new center will have access to the intellectual horsepower, manufacturing and test capabilities that have long been the Rochester region's competitive advantage."